I recently returned from my third trip to Buenos Aires with the Klezmatics. 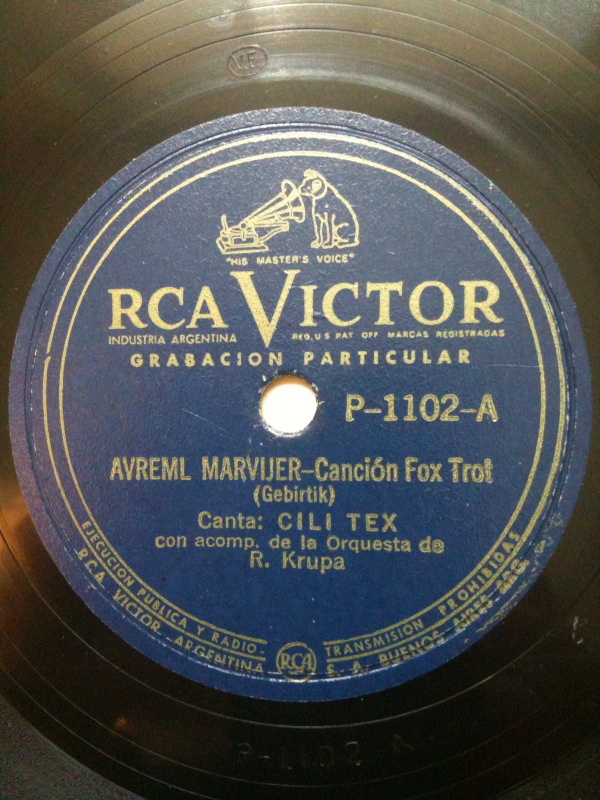 As in the past, I visited General Director Miguel (Mickey) Steuermann and on-air host Danny Saltzman at Radio Jai (the only full-time Jewish radio station in the Americas), and, as on my last visit some eight years ago, they were kind enough to donate some more rare Argentine 78rpm and lp discs to YIVO. Then, on a tip from bandmate Frank London about a bookstore where he saw “a few Yiddish lps” I made my there and, instead, found albums stuffed with more Yiddish records, bringing the total to 45 78s and 25 lps. After spending a futile morning attempting to ship everything home (with no help from the Katisha-like customs officer at Correi0 Argentino), I lugged it all back to NYC on our flight from BA. Thanks to Lisa and Matt’s running interference and help, the precious pile of shellac, vinyl and crumbling cardboard has arrived intact. Cili Tex? So naturally I gave it a spin. Aha! The Argentine-Yiddish Piaf? Who knew? What strikes me about this performance is its spotaneity – much like a live performance. What’s not to like? The song is a well-known one by the Yiddish bard of Krakow, Mordecai Gebirtig (1877-1942). Avreml der marvikher (Little Avram, the Pickpocket) is a slice of the underworld story of a teenaged thief, who begins his tale by bragging of his expertise. He then goes on to predict his own demise from the vestiges of living the tough life of a street kid, which he feels he would have been spared had he not been orphaned at an early age. This is definitely one of the earliest-known recordings of Avreml, (the other is by Elwira Boczkowska, which, coincidentally, was in this pile of discs, too. She also recorded it for a European label, issued [illegally?] by Stinson in the U.S. with the first verse cut off). At last, a look inside the YIVO inner sanctum. Please keep it up! I’l keep listening. wonderful, lorin! now, leave us recordings that we can listen to of the songs you mention!!! Beautiful performance – thanks for the blog. Couldn’t find any mention of Cili Tex in the Yiddish Theater Lexicon. We should ask Shifre Lehrer. Any archive in Argentina or recordings of the actor and composer Shlomo Pryzament, author of “Broder zinger” who died in Buenos-Aires? We also have here three other sides by Tex – two of which are songs associated with Nellie Casman. I’m curious to know anything at all about her. The only thing I can find related to Pryzament is his adaptation of a lovely (Argentine?) song (in Yiddish it’s Tseshelte vegn) that was recorded by Max Zalkind, which I have performed a few times. Yasher koyekh, Lorin, on this new blog. I get an archival thrill from hearing about your find of these treasures in Buenos Aires and about all your ethnographic detective work! Yasher koyekh! Thanks for starting the blog and what a great choice for a first recording. Fantastic voice & singing style: Cili Tex is my new favorite (and her name could fit so many genres). Mazel tov on this blog, and thanks for your dedication in tracking down and shlepping back all this music.